Intimates and Sleepwear. Heel Type - Stiletto. Kate Spade. Style - T-Strap Heels. Special Details - Platform, Buckle Closure, Minor Marks On Upper, Minor Wear On Soles And Insoles, Very Condition. We have a large selection of clothing, shoes, belts and handbags. ALDO Black Laser Cut Ankle Tie Lace Up heels size 7 A24. Designer/Label - Nina. Material - Satin. 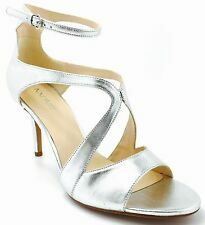 Special Details - Open Toe, Slip On, Worn Once, Faint Marks On Satin, Excellent Condition. We have a large selection of clothing, shoes, belts and handbags. With over 2000 of the most desirable labels in our inventory, you’re bound to find lots of rare and hard to find pieces as well as common necessities. Heel Type - Stiletto. Designer/Label - Dolce Vita. Material - Suede. We have a large selection of clothing, shoes, belts and handbags. With over 2000 of the most desirable labels in our inventory, you’re bound to find lots of rare and hard to find pieces as well as common necessities. Intimates and Sleepwear. Designer/Label - Cole Haan. Heel Type - Stiletto. Style - Strappy Heels. Occasion - Casual. We have a large selection of clothing, shoes, belts and handbags. With over 2000 of the most desirable labels in our inventory, you’re bound to find lots of rare and hard to find pieces as well as common necessities. Designer/Label - Christian Lacroix. Intimates and Sleepwear. Ann Taylor LOFT. Kate Spade. Style - Open Toe Heels. Jimmy Choo. We have a large selection of clothing, shoes, belts and handbags. With over 2000 of the most desirable labels in our inventory, you’re bound to find lots of rare and hard to find pieces as well as common necessities. Designer/Label - Ralph Lauren Purple Label. Ralph Lauren. Special Details - Platform, Buckle Closure, Peep Toe, Scuffs, Minor Wear, Minor Gouges On Heels At Bottom, Great Condition. We have a large selection of clothing, shoes, belts and handbags. Designer/Label - Bakers "Gwen". Special Details - Light Coral Pink Laces, Lace Up, Back Zipper Closure, Open Toe, Platform, Minor Scuffing, Minor Nick On Toe, Minor Wear On Soles And Insoles, Good Condition. Designer/Label - Lanvin. We have a large selection of clothing, shoes, belts and handbags. With over 2000 of the most desirable labels in our inventory, you’re bound to find lots of rare and hard to find pieces as well as common necessities. Heel Type - Stiletto. Style - Sandal Heels. Designer/Label - Ralph Lauren Collection Purple Label. Ralph Lauren. We have a large selection of clothing, shoes, belts and handbags. With over 2000 of the most desirable labels in our inventory, you’re bound to find lots of rare and hard to find pieces as well as common necessities. Model: LUCE. Type: Slip On Sandals Open Toe. Partially-wrapped heel. Material:Leather upper - Man made lining - Rubber outsole. Color: Black and Off-White/Black Snake Print. Designer/Label - Alejandro Ingelmo. Platform Height - 1. We have a large selection of clothing, shoes, belts and handbags. With over 2000 of the most desirable labels in our inventory, you’re bound to find lots of rare and hard to find pieces as well as common necessities. This is a gorgeous pair of cognac suede leather sandals by Cynthia Vincent in a size 6. These are open toe and strappy. The heel is a 4 1/4" slim wooden stacked heel. These sandals are NEW WITHOUT THEIR ORIGINAL BOX. Intimates and Sleepwear. Designer/Label - Guess By Marciano "Realize". Ann Taylor LOFT. Kate Spade. Style - Open Toe Heels. Jimmy Choo. We have a large selection of clothing, shoes, belts and handbags. Heel Type - Stiletto. Diane Von Furstenberg. Designer/Label - Diane B. Material - Suede. We have a large selection of clothing, shoes, belts and handbags. With over 2000 of the most desirable labels in our inventory, you’re bound to find lots of rare and hard to find pieces as well as common necessities. Designer/Label - Nordstrom. We have a large selection of clothing, shoes, belts and handbags. With over 2000 of the most desirable labels in our inventory, you’re bound to find lots of rare and hard to find pieces as well as common necessities. Kate Spade. Designer/Label - Kate Spade. Special Details - Peep Toe, Slip On, Minor Sun Bleaching On Patent, Minor Scuffing On Patent, Minor Wear On Soles And Insoles, Great Condition. This section will auto expand to fit your content. Designer/Label - Nina. Material - Satin. We have a large selection of clothing, shoes, belts and handbags. With over 2000 of the most desirable labels in our inventory, you’re bound to find lots of rare and hard to find pieces as well as common necessities. Stuart Weitzman. Designer/Label - Stuart Weitzman. Ann Taylor LOFT. Jimmy Choo. Material - Believe To Be Satin (Satin Has Slight Shine). We have a large selection of clothing, shoes, belts and handbags. Heel Type - Stiletto. Designer/Label - Lamb. We have a large selection of clothing, shoes, belts and handbags. With over 2000 of the most desirable labels in our inventory, you’re bound to find lots of rare and hard to find pieces as well as common necessities. Special Details - Slip On, Pointed Toe, D'Orsay Style, Minor Wear And Marks On Suede Upper, Minor Gouge On Right Heel, Faint Marks On Insoles, Minor Wear On Soles, Good Condition. Material - Believe To Be Suede. Heel Type - Stiletto. Designer/Label - Dolce Vita. Special Details - Slip On, Platform, Faint Marks In Patent Leather Upper, Very Small Indent At Seam In Patent, Minor Wear On Soles And Insoles, Very Good Condition. Material: Suede/leather upper - leather sole. Taupe-gray-beige color. SLIP-ON DESIGN WITH RUFFLE CROSSOVER STRAP. NAPPA LEATHER UPPER IN SOFT PINK. 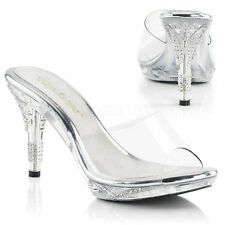 SIZE 7 M. WRAPPED STILETTO HEELS- HEIGHT 3 1/4". Intimates and Sleepwear. Style - Slingback Heels. Heel Type - Stiletto. Designer/Label - Giorgio Armani. Kate Spade. Platform Height -. 75. We have a large selection of clothing, shoes, belts and handbags. Badgley Mischka. Designer/Label - Badgley Mischka. Intimates and Sleepwear. Kate Spade. Style - Ankle Strap Heels. Occasion - Casual. We have a large selection of clothing, shoes, belts and handbags. Intimates and Sleepwear. Designer/Label - Cole Haan. Kate Spade. Special Details - Slip On, Pointed Toe, Minor Scratches On Upper, Minor Scuffing On Heels, Minor Wear On Soles And Insoles, Very Good Condition. Intimates and Sleepwear. Designer/Label - Cole Haan. Heel Type - Stiletto. Ann Taylor LOFT. Kate Spade. Special Details - Buckle Closure, Open Toe, Worn Once, Excellent Condition. Heel Height - 3.25. Designer/Label - Pour La Victoire. Intimates and Sleepwear. Kate Spade. Special Details - Slip On, Pointed Toe, Very Minor Scratches On Heels, Minor Wear On Soles And Insoles, No Flaws, Excellent Condition.